Weirdly, the lead-up to Justin Timberlake’s big return to the Super Bowl halftime show has been largely about managing expectations. Rather than teasing something that the world has never seen before, Timberlake has been telling people not to get too excited about a surprise appearance from Janet Jackson or the other members of ‘N Sync as rumors spread about a scheme that would directly contradict the wishes of Prince by resurrecting him as a hologram. Because of that, the hype for tonight’s big mid-football performance seemed a bit lacking, which sort of came through in the largely standard opening medley. 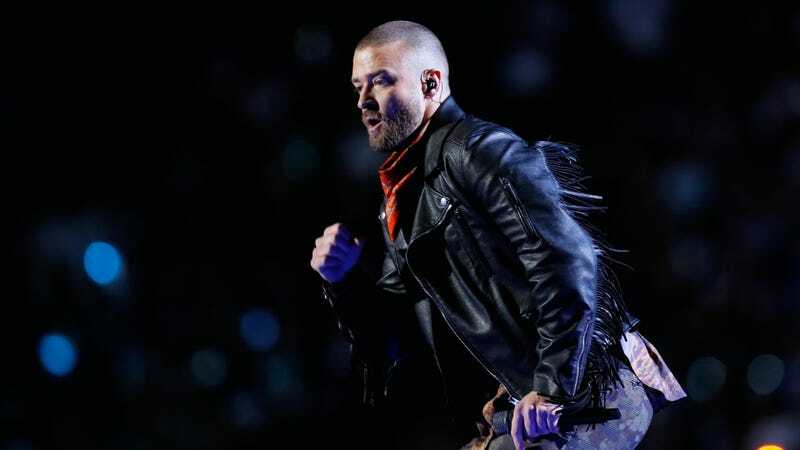 Focusing more on dancing than singing, Timberlake bounced out onto the field from below the stadium and eventually broke into “Rock Your Body”—though he himself off right before the line that got him into a bit of trouble during his last appearance at the Super Bowl (and missing what would have been a perfect opportunity to introduce Janet Jackson). After working through more of his solo catalog, Timberlake slowed things down for a little tribute to Prince that definitely did not include a hologram, even if projecting Minnesota’s favorite son onto a giant sheet billowing in the (fake) wind did seem suspiciously hologram-esque. He later broke into “Can’t Stop The Feeling,” best known as the inescapable song from Trolls, before running up into the stands and giving a bunch of fans a chance to look at him through their phones instead of just living and appreciating the fact that they were a foot away from Justin freakin’ Timberlake.